A thirsty koala was given a drink from a kind passer-by during the heatwave which baked Victoria’s north-west. With the temperature sitting at 44 degrees Celsius, Chantelle Lowrie noticed the koala by the side of the road on the banks of the Murray River, north of Strathmerton. “My first thought was that the poor little fella needs a drink,” Ms Lowrie said. She approached the koala, which started to climb a tree, but it then stopped to drink water as she poured it from a bottle. The koala drank for about 25 seconds before continuing up the tree. 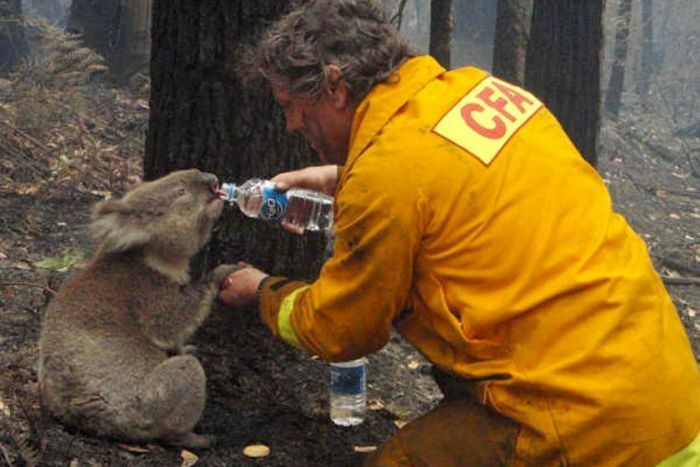 The footage is reminiscent of the famous footage of a firefighter giving water to a koala, who was dubbed Sam and became the global face of devastating bushfires in Victoria a decade ago. Country Fire Association volunteer David Tree gave water to the burnt and thirsty Sam after a backburning exercise in Gippsland in late January 2009. Another koala was captured on video drinking from a water bottle in the Adelaide Hills after bushfires in the Adelaide Hills in 2015.